If you ever want to see how apt a metaphor, “pecking order” is for hierarchical office politics, feed your laying flock an hour late. I slept in this morning, and I usually wait about an hour after letting the chickens out to give them their daily (in the Drummies’ case, twice daily) ration. That gives them time to stretch their legs and forage for weed and bug appetizers before they’re sated with grain. So, it was 8:30 by the time I got out to fill the feeders. 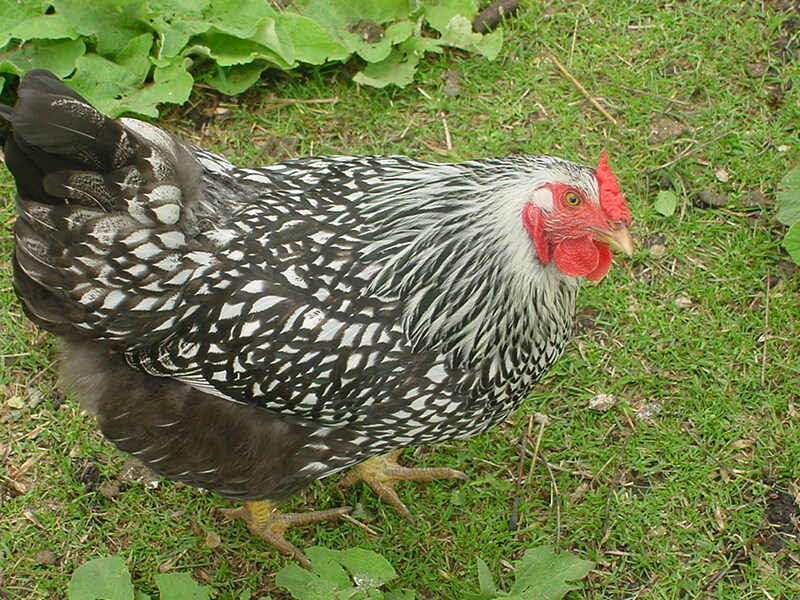 The Barred Rocks, Ruby and Bea, are the unquestioned queens of the flock, along with Lacey, the Silver Lace Wyandotte. Lacey Does. Not. Allow. any younger or smaller hen anywhere near the feeder–they don’t belong there until she is finished, and she’s not sure they belong there at all. Ruby and Bea are a little more mellow so long as any interlopers don’t interfere with their right to eat from any and every part of the feeder they want. Insubordination is met with a harsh verbal and physical reprimand. 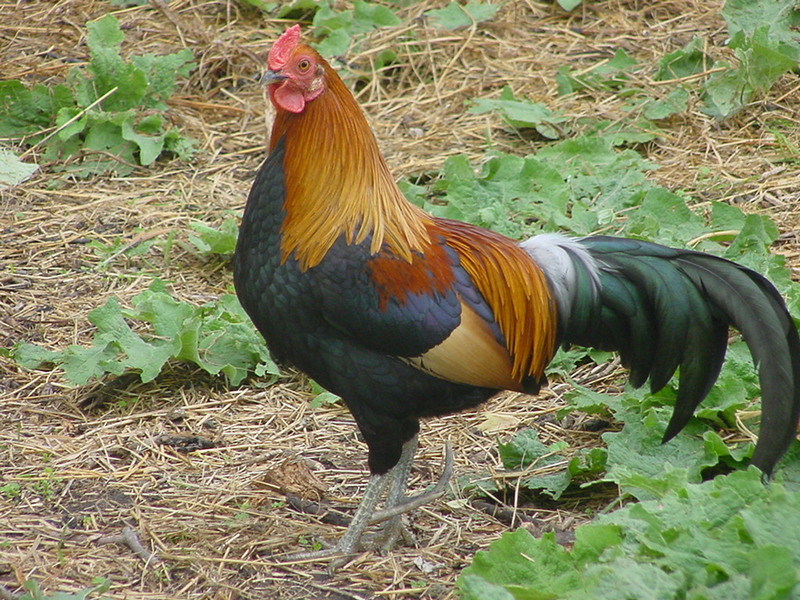 Spurz, our little Jungle Fowl rooster, is also at the top–the bigger ladies may not respect him in other ways, but they don’t chase him from the feeder. 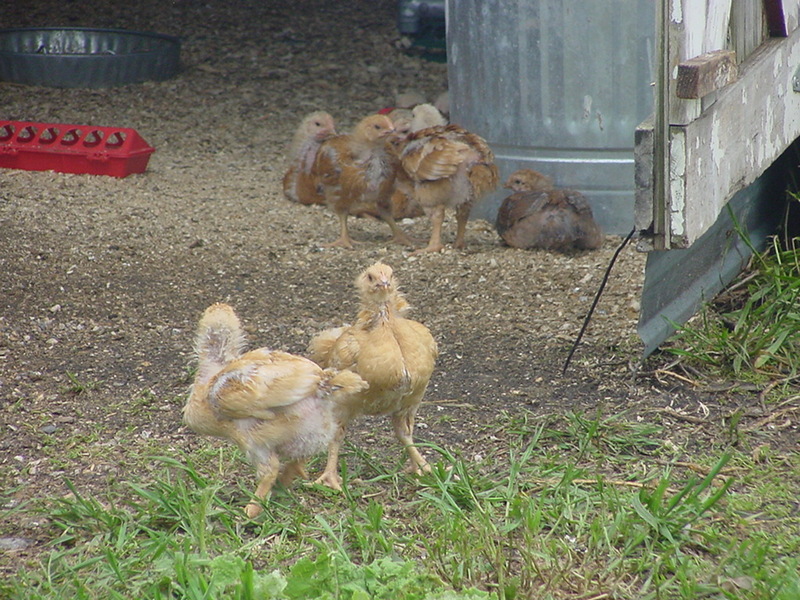 The second-tier hens are also fully mature from last year’s starter flock–they’re just smaller than the others (though as big as, or bigger than Spurz), so they have to wait their turn. If they don’t find you handy, they should at least find you handsome. While the Americanas (Gilda and Frannie) respectfully wait to eat until the big girls are getting full, the Silkies are always jockeying for position. Robeson especially likes to sneak in and grab a beak-full of grain with the big hens, then run back out when she’s pecked–proceeding to give as much and more grief to the younger pullets flocking around the periphery. Robeson’s broody mates, Fog and Micheaux, take turns running out of their corner to steal some grain, careful to keep their prize egg hidden from view and squawking loud warnings when the pullets come too close. Talk about micro-managers! And the poor pullets? Well, the six I’ve collectively nicknamed “juvenile delinquents” are now as big as Spurz-the-rooster, and bigger than the Silkies. But it’s not size that matters at this point–it’s sheer meanness! 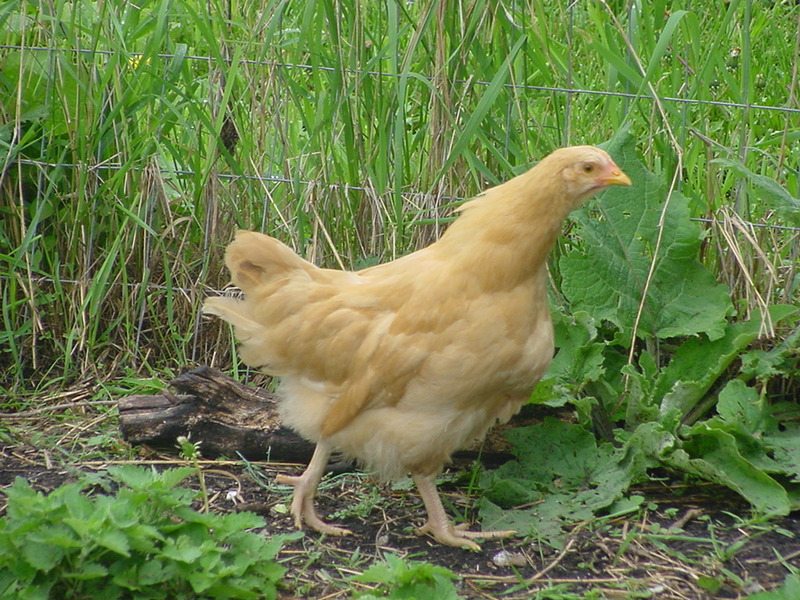 One of the new-crop Americanas is almost as big now as Gilda and Frannie, and she lords it over her brooder-mates. But when it comes feeding time, she hasn’t yet developed the “pluck” to challenge the higher-ups–and especially the middle management Silkies. Last on the pecking order are the youngest–the nine Buff Orps and Black Australorps that are catching up to the “delinquents” in size, but who know better than to venture into the henhouse when the big girls are eating. Well, all except for this one rogue Orpington, who starts to peek in the door once the big girls have gone out and the second-tiers are getting at the “goods.” I think she’s the same one who gives us such grief every evening when it’s time to go in–breaking off from the flock and dodging out of the run to hide back under the currant bushes. I don’t know if it’s cleverness or sheer obstinance, but I do know she’s careful to remain out of range of the Silkies’ cruel beaks. There’s a lot less strife when it comes time for the two batches of this year’s pullets to eat. There are more of them, but they fit better around the feeder, and I think the fact that they’re merging in size and that they spent a few weeks in the brooder together makes them a little less likely to jockey for position. While there’s plenty of politics in the henhouse during a late feeding, I haven’t noticed anything like it with the “Drummies.” Sure the Red Rangers are constantly challenging each other out in the run–standing up tall and facing off (I swear they’d beat their breasts with tiny fists if they had them) before forgetting what the big deal was and running off in different directions–but feeding time is something altogether different. What’re you lookin’ at? I outweigh you by an ounce! Maybe a better metaphor here is the 99%? Most of the time they’re running in all different directions satisfying each individual’s chicken-y desires and getting a little peevish if anyone or anything gets in their way. But occasionally, like when I open the kennel and they taste the freedom of the morning, or when a shadow or loud noise threatens the flock, they all move together with a whooshing of wing feathers and a collective purpose that’s beautiful, powerful, and incredibly fun to watch.